Allow me to get serious and nostalgic for a bit. 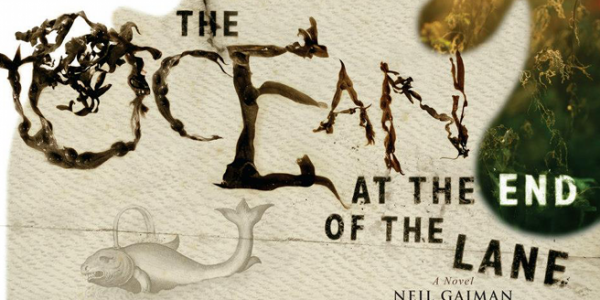 I’m not sure entirely what to think about Ocean at the End of the Lane by Neil Gaiman. I read through his latest in a day or two, making sure I lingered on every word and rereading some scenes because that’s what I was told to do. The book is less than 200 pages and it was a necessity to not rush through it, although that’s what ended up happening. In a way, even after all of the close reading and lingering I still don’t feel like I remember it. I feel like I missed something important. I want to reread it, hoping that I’ll catch whatever it is that keeps running away. It’s like when I walk into a room and forget what I came in there for, although I hope that what I forgot will jump out at me and make everything clear. Things become clear over time, but I really have to dig deep into my head to find the answer. I’m sure this was all done on purpose. Gaiman is a master at his craft and it should come as no surprise that his latest novel is another piece of evidence that this is beyond true. But I still have issues as to why that is. That’s why I’m using this blog as a way to sort out my feelings. Granted on the surface, this book is appealing, well written, beautiful, tragic, and any number of other adjectives you can think of. However, to truly enjoy Ocean, you can’t just rely on appearances. You have to sink deeper into the ocean. The ocean here is a child’s imagination, something that many of us have lost over time, which is why our main character can’t see it. As we get older, our sense of wonder diminishes. I have memories of playing by myself in my play room, pretending I was a witch and talked with ghosts that lived in the back of my closet. I’m not sure where it happens or why, but those fantasies seem silly in retrospect. Back before I knew what the world was, it was limitless and ideal. That’s why we write and read fiction: Because we want to go back. The sad thing is that as much as I appreciate everything that my childhood let me explore, I realize that any longing for that place is futile. My brain is no longer physically capable of going to some alternate dimension and feeling safe. The few times I wander there, it’s seen as a negative. I’ve been told constantly not to live in my head, and I’m not going to. Our protagonist—a middle-aged man in his forties—visits his home village and eventually wanders to the “ocean” at the end of the lane. He can’t understand why he only sees a pond–Lettie Hempstock says it’s an ocean, but it’s too small. Despite the title of the novel telling you otherwise, you wonder exactly what the book will reveal. The man goes back into his memories and remembers the ocean as it exists in the child’s mind. As our main character (who remains unnamed) gets to know the family of women who live in the house at the end of the lane, more of the fantasy world gets revealed and you become more a believer; more nostalgic. The novel becomes less about the story and more about the emotions it represents. It doesn’t just tell one story but hundreds. They’re all ones you’ve heard before, but you had forgotten they existed. The children in the book are mature and brave against the threats that take over, but they’re still children—forgotten by the world and overlooked by the adults despite the truths that seem to be smacking them in the face. Because in Gaiman’s works, the fantasy isn’t just imagination: It’s how the world really is. And if the world–our world—is the same one depicted in the novel, then doesn’t that mean we’re missing out on something? Isn’t that why we’re drawn to the things of the past, in the same way that the protagonist is drawn to the ocean? I can’t help but feel saddened by that thought. I know there’s another word beyond “sad” but it seems to capture the simplicity of the motion perfectly. So I guess this is less of a “review” as it is a “reflection,” since I can’t really describe the book without delving into how I feel. Ocean at the End of the Lane is an experience, a work that does more than just drill you with a bunch of flowery language. What it evokes is something much more powerful than the sense of accomplishment after putting down a book after you’ve finished it. It’s something that creates a spark, digs deeper than anything else. In reality, the book itself is the ocean. There’s more to it than meets the eye. I finished The Ocean at the End of the Lane a couple weeks ago, and loved it with a similar sense of nostalgia and longing. Like I’m stuck being the little kid who grows up and forgets everything, and I really, really just want to be a Hempstock. I’d also just finished Grossman’s The Magicians, and they make an interesting pair–both of them are coming of age stories, and both of them have a lot to say about the nature of fantasy and belief and adulthood, but Gaiman’s didn’t have that bitter, kind of cynical edge to it. Yeah. I felt like the book was a kick in the face, almost like Gaiman pointing at me and asking what I had forgotten. I felt almost ashamed. I haven’t read the other one. Looked it up and it seems interesting, although I think I’ll have to wait a little while before I read it so I don’t get the comparison with it and Ocean. Now that you’ve mentioned it, I’m going to see it!